To celebrate their history, First Manchester have painted 8 buses in their heritage livery, in order to highlight the importance to remember the history of local communities. Lancashire United Transport was formed in 1905 to take over the operations of the South Lancashire Tramway Co. to run trams and later buses in South Lancashire from three bases in Swinton, Hindley and the main head office and works at Howe Bridge, Atherton. On 1st January 1976 LUT was taken over by Greater Manchester Transport but continued to run largely independent until being fully absorbed into GMT in 1978. This vehicle, no.37430, has been repainted into the last livery used by Lancashire United to form part of a new 'Heritage Fleet' aimed at remembering the predecessors of our company and to show new generations the history of our public transport in Greater Manchester. Bolton Corporation Tramways was formed in 1899 to take over the operations of the Bolton Horse Tramway to run electric trams in the Bolton area. The last trams ran on 29th March 1947 with the network being taken over and expanded by motorbuses under the Bolton Transport name with garages on Shifnall Street, Bridgeman Street and Crook Street. On the 1st November 1969 all Corporations in the area, including Bolton, were grouped together into one local body called SELNEC PTE which stood for "South East Lancashire, North East Cheshire Passenger Transport Executive" and the maroon and cream livery was swapped for sunglow orange and mancunian white. This vehicle, no.69139, has been repainted into the last livery used by Bolton Transport to form part of a new 'Heritage Fleet' aimed at remembering the predecessors of our company and to show new generations the history of our public transport in Greater Manchester. Ramsbottom UDC began running trolleybuses in 1912 after an attempt to open a tramway network stalled due to costs. A small depot was constructed on Stubbins Lane, Ramsbottom to park and maintain the vehicles. 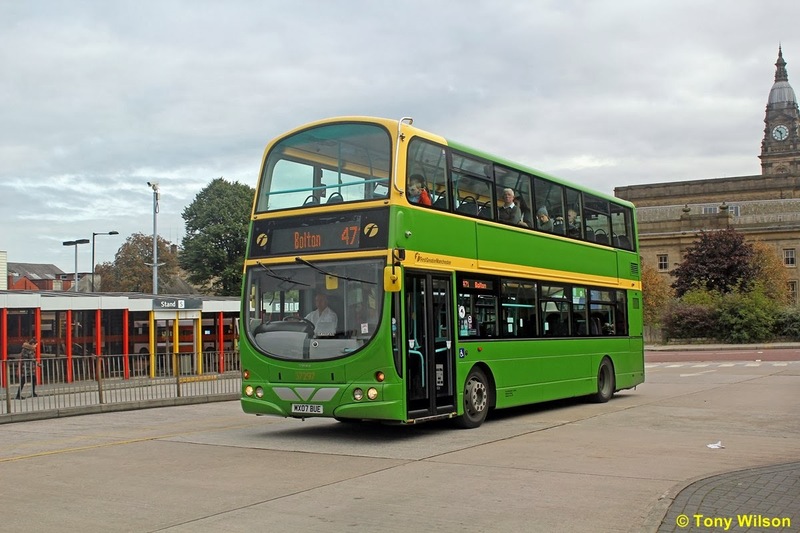 In the middle of 1923 Ramsbottom UDC began operating a motorbus to connect two trolleybus routes and started to convert fully to motorbuses during 1926, although the last trolleybus actually ran on the 31st March 1931. On the 1st November 1969 all Corporations and Undertakings in the area, including Ramsbottom UDC, were grouped together into one local body called SELNEC PTE which stood for "South East Lancashire, North East Cheshire Passenger Transport Executive" and the crimson and cream livery was swapped for sunglow orange and mancunian white. Despite the undertaking no longer existing, Ramsbottom UDC still made history when in 1969 and just a few days after SELNEC took over, the former UDC took delivery of the very last half cab Leyland bus to come off the production line. Painted in full Ramsbottom livery, complete with coat of arms this vehicle also became the only brand new half cab bus to operate for a PTE anywhere in the country. Ramsbottom was also the smallest undertaking taken over by SELNEC with a total of 12 buses in 1969. This vehicle, no.69166, has been repainted into the last livery used by Ramsbottom Urban District Council to form part of a new 'Heritage Fleet' aimed at remembering the predecessors of our company and to show new generations the history of our public transport in Greater Manchester. Bury Corporation came into being in the late 1900s with a view to running electric tramcars in the town. In 1902 a new depot was constructed on corporation land on Rochdale Road and in the evening of the 3rd June 1903, Bury Corporation Tramways was officially opened. By 1908 the depot had been expanded to house more trams as the network expanded. In the period just after the First World War, the Bury Postmaster approached the Tramway committee with a view to transporting mail on the trams from Bury to Bolton and Rochdale. This was agreed upon, as long as a fare was paid for each mail bag. The bags would be secured to a handrail on the platform with a padlock and chain and unlocked at the other end by a postman who would take the mail bags to a post office. Infact, this scheme continued right up until 1969! Motorbuses began operating in the town on Friday 18th September 1925 and by the 13th February 1949 almost 1500 residents came out to watch the last tram enter the depot for the final time, with many removing items from the tram as souvenirs! The motor bus livery of grass green and cream was introduced in June 1944 replacing the previous vermilion and cream. On the 1st November 1969 all Corporations and Undertakings in the area, including Bury, were grouped together into one local body called SELNEC PTE which stood for "South East Lancashire, North East Cheshire Passenger Transport Executive" and the green and cream livery was swapped for sunglow orange and mancunian white. This vehicle, no.37297, has been repainted into the grass green and cream livery used by Bury Corporation Transport to form part of a new 'Heritage Fleet' aimed at remembering the predecessors of our company and to show new generations the history of our public transport in Greater Manchester. Manchester City Transport began life in 1901 as Manchester Corporation Tramways to run electric trams in the Manchester region and becoming the Manchester Corporation Transport Department in 1929. The last trams ran on 10th January 1949 after the network had been wound down with the conversion to trolleybuses and motorbuses under the Manchester Corporation Transport name with garages on Birchfields Road, Parrs Wood, Princess Road, Queens Road and the Headquaters, depot and works on Hyde Road/Devonshire Street. On the 1st November 1969 all Corporations in the area, including Manchester City Transport as it had become known, were grouped together into one local body called SELNEC PTE which stood for "South East Lancashire, North East Cheshire Passenger Transport Executive" and the red and white livery was swapped for sunglow orange and mancunian white. MCT was the largest of the corporations taken over by SELNEC. This vehicle, no.37289, has been repainted into the last livery used by Manchester City Transport to form part of a new 'Heritage Fleet' aimed at remembering the predecessors of our company and to show new generations the history of our public transport in Greater Manchester. Salford City Transport started life on the 2nd May 1901 as Salford Corporation running horse drawn tram cars and lines purchased from neighbouring Manchester in a red and white livery. By September 1901 the corporations first electric tramcars were delivered and put into service operating from a grand depot and works on Frederick Road. By July 1920 the Corporations first motorbuses started to be delivered and a new depot in Weaste was constructed to house them. The last trams ran in Salford on the 31st March 1947, delayed from 1939 due to the war. 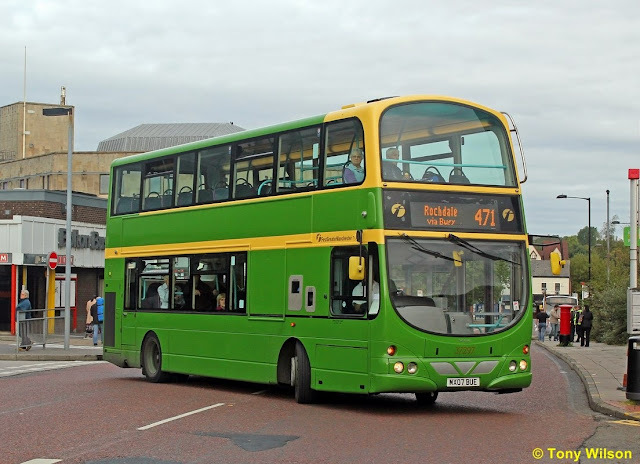 In 1946 the Corporation became Salford City Transport and with it, the livery changed to green and cream. On the 1st November 1969 all Corporations and Undertakings in the area, including Salford, were grouped together into one local body called SELNEC PTE which stood for "South East Lancashire, North East Cheshire Passenger Transport Executive" and the green and cream livery was swapped for sunglow orange and mancunian white. Salford City Transport was the second largest of the Corporations taken over by SELNEC. This vehicle, no.37290, has been repainted into the distinctive 1950s livery used by Salford City Transport to form part of a new 'Heritage Fleet' aimed at remembering the predecessors of our company and to show new generations the history of our public transport in Greater Manchester. Rochdale Corporation began operations on the 22nd May 1902 with its first electric tramcar. In 1925 the corporation bought the neighbouring Middleton Electric Tramways Co and its first motorbus began service in March 1926. 12th November 1932 saw the last tram service operate and in 1937 the tramway livery of dark brown and pale yellow gave way to Oxford blue and cream on motorbuses. The corporation's depot was located on Mellor Street and was split across two sites. On one side of the road was the works area and the other was the main parking area and offices. On the 1st November 1969 all Corporations and Undertakings in the area, including Rochdale, were grouped together into one local body called SELNEC PTE which stood for "South East Lancashire, North East Cheshire Passenger Transport Executive" and the blue and cream livery was swapped for sunglow orange and mancunian white. This vehicle, no.37451, has been repainted into the distinctive 1930s livery used by Rochdale Corporation Transport to form part of a new 'Heritage Fleet' aimed at remembering the predecessors of our company and to show new generations the history of our public transport in Greater Manchester. Oldham Corporation began operations on the 15th December 1900 with its first electric tramcar. In 1925 the corporation began replacing parts of its tram network with trolleybuses after being requested to do so by Ashton Corporation with whom they ran a joint service. The trolleybuses lasted just over a year when they were replaced by motorbuses. The tram network was slowly wound down and replaced by motorbuses with the last trams running on the 3rd August 1946. The original motorbus livery of dark blue and white was replaced in 1931 by crimson and lake before being modified again in 1966 to pommard and cream. The corporation's depot was located on Wallshaw Street and is still in use today with First GreaterManchester's Head Office being located opposite the depot entrance. On the 1st November 1969 all Corporations and Undertakings in the area, including Oldham, were grouped together into one local body called SELNEC PTE which stood for "South East Lancashire, North East Cheshire Passenger Transport Executive" and the pommard and cream livery was swapped for sunglow orange and mancunian white. This vehicle, no.66869, has been repainted into the last livery used by Oldham Corporation Transport to form part of a new 'Heritage Fleet' aimed at remembering the predecessors of our company and to show new generations the history of our public transport in Greater Manchester. However, to date the only one captured by the Focus Transport team is of number 37297 in the Bury Corporation livery. 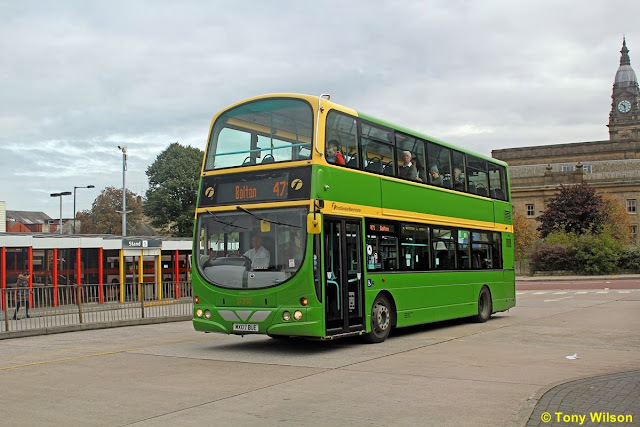 The near and offside aspects are illustrated as the bus operated over route 471 from Rochdale via Bury to Bolton, the latter town being where the bus was seen recently in October.